Please visit the WomenArts Blog to see articles from this email online. Congratulations to Jan Lisa Huttner!! The WomenArts staff is officially on vacation this summer, but we are briefly back this week to congratulate our friend and colleague, Jan Lisa Huttner (also known as The Hot Pink Pen) on the tenth anniversary of Women in the Audience Supporting Women Artists Now/WITASWAN, the fore-runner of Support Women Artists Now Day/SWAN Day. In 2002, Jan Lisa Huttner was working as a film critic in Chicago when she came across an article in the New York Times by Dana Kennedy that cited an annual study called "The Celluloid Ceiling" by Professor Martha Lauzen of San Diego State University. The study reported that in 1987, women directed only three of the 100 highest-grossing films. By 2001, that number had only risen to four out of 100. Huttner decided to do something about these outrageous statistics. She wrote a letter to the New York Times, she used her website to publish a summary of Lauzen's 2002 findings and an interview with her, and she started lecturing on the topic. Since women buy a lot of movie tickets, Huttner started looking for ways to mobilize women to use their ticket-buying power in support of women filmmakers. In 2004, she persuaded the Illinois chapter of the American Association of University Women to create an "incubator" project called "Women in the Audience Supporting Women Artists Now" or "WITASWAN" that would help women recognize their power as film consumers. WITASWAN was conceived as a grass roots movement instead of a formal organization. There are no application forms or dues. Anyone can join at any time by making a personal commitment to seeing at least one film a month that is written or directed by women, whether it is in a theatre, on DVD or online. Over the past ten years WITASWAN has grown into an informal alliance of women and men around the world. Some members get together to go to films and discuss them, some organize screenings of films by women, and some just watch the films on their own. WITASWAN has also inspired women in other art forms to create similar organizations. For instance, there is now a Meetup group in New York and another in San Francisco for people who want to attend theatre by women once a month. Please let us know if you are aware of other groups that encourage attendance at women's art events. WomenArts Executive Director Martha Richards learned about Jan Lisa Huttner and WITASWAN when Huttner joined the WomenArts Network in 2005. They began corresponding and in April 2007 they gave a joint presentation at an American Association of University Women spring conference in Bloomington, IL. The growth of WITASWAN and SWAN Day prove that we have tremendous power to inspire each other to do great things. Jan Lisa Huttner was sparked by Dana Kennedy's article about Martha Lauzen; Martha Richards saw ways to build an international holiday based on Huttner's work; and now thousands of people around the world have participated in WITASWAN and SWAN events and shared the power women's art with countless others. We live in a fiercely competitive world where we are often asked to prove that we are unique or better than others in order to obtain jobs or funding, but WITASWAN and SWAN Day are part of a different model. Our goal is to create a world where we can share our struggles and celebrate each other. Although the path is often challenging, it is important to recognize that we are part of the ongoing world-wide movements for women's equality and social justice and that millions of people around the world share our values. WomenArts sends thanks to Jan Lisa Huttner for her perseverance and dedication to women artists, and thanks to all of you who are working for gender parity in the arts. Together we are building a world where the full power of women's creativity will be recognized at last. Jan Lisa Huttner is a film critic now based in Brooklyn, New York. She has been the driving force behind Women in the Audience Supporting Women Artists Now/WITASWAN, and she co-founded Support Women Artists Now Day/SWAN Day with WomenArts Executive Director, Martha Richards. She publishes film reviews and commentary as The Hot Pink Pen. Penny?" section of her website. In celebration of the 10th anniversary of WITASWAN, the Chicago chapter of the American Association of University Women is hosting a showing of The Girls in the Band at the Cinemark Century 12, 1715 Maple Ave, Evanston, IL at 1 p.m. on Saturday, August 16. 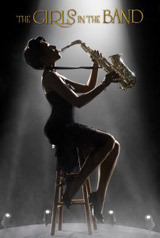 The film is a documentary directed by Judy Chaikin about female jazz and big band instrumentalists and their groundbreaking journeys from the late 1930s to the present day. These talented women endured sexism, racism and diminished opportunities for decades, yet continued to persevere and inspire. Chaikin will be present for a post-show discussion. You can watch the trailer on the film's website or buy tickets to the Evanston screening. If you like the work that WomenArts is doing, please consider making a contribution. Gifts of every size will be deeply appreciated! Everyone Is Invited to Celebrate SWAN Day! Support Women Artists Now Day/SWAN Day is a grassroots "do it yourself" holiday, and everyone is invited to join us in honoring women's creativity. The official date for the 8th International SWAN Day is Saturday, March 28, 2015, but please feel free to celebrate it any time during March or April that is convenient for you. The spirit of SWAN events is far more important than the exact dates. We will be featuring SWAN events in the WomenArts Blog and newsletters during March and April 2015. If you want us to write about you, creating a listing in the SWAN Calendar is the best way to let us know about your event. Free monthly Theatre Funding Newsletters are now being published by the Women in Arts and Media Coalition in collaboration with the League of Professional Theatre Women. You can see the current issue by clicking here. To sign up for the email version of these newsletters, please click the link in the right margin of their newsletter. Free monthly Film/Video Funding Newsletters are now being published by the Women in Arts and Media Coalition. You can see the current issue by clicking here. If you would like to sign up to receive the email version of their newsletters, please fill in the form at the bottom of their newsletter. If you are receiving this letter from a friend and would like to join our mailing list, please click here to subscribe. To unsubscribe, please click here to unsubscribe.